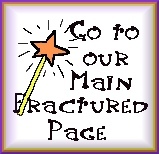 Fractured Fairy Tale: King Midas. These are best when seen as an animated cartoon. My page really doesn't do justice to the creativity. Once upon a time there was a king named Midas. Even by kingly standards, Midas was a greedy king. All he cared about was gold, gold, gold, and let's see, oh yes, gold. So he sent his tax collectors into the kingdom to do his gold gathering for him. As the people grew poorer and poorer from being taxed, Midas grew richer and richer. Finally, the people were reduced to living on turnips and nothing but turnips. For breakfast, they had bowls of turnip flakes. For lunch, turnip sandwiches. And for dinner, roast leg of turnip with turnip gravy. By the time the got around to dessert---turnip torte---they were plain sick of tubers. As a result, King Midas began to get the funny feeling that people didn't like him very much. The teeming masses holding up signs that read "Off with King Midas's head!" didn't help. Not that he cared about them. But what he did care about was that he couldn't raise taxes. "I need to do something to make people like me," declared King Midas. "Then I can tax them even more!" So the king called a meeting of his advisers, from the prestigious advising firm of Bobble, Bangle, Bead, and Benson. "Gentlemen," said the king, "I must be made more popular." "Well, sire," piped up Benson, "I'm just talking off the top of my thatch, here. But what about lowering taxes? We could----"
That apparently wasn't a very good idea. Two palace guards grabbed Benson and carried him off to the dungeon. The next day, the king called a meeting of his new advising firm, Bobble, Bangle and Bead. "Let's put this idea on the rack and see how it stretches," said Bead. "What we'll do is point out your warm, human qualities." "What warm, human qualities?" asked the king. "Well, you must have some. Dogs, for instance. Everyone likes dogs." "I hate dogs," said the king. "I can see it now," said Bead. " 'Midas loves Mutts' on posters all over the kingdom!" "How much will it cost?" asked the king. So the plan was set in motion. It was announced that the king would set free all dogs in the royal dog pound. And sure enough, as the people watched, the king let all the dogs loose. It was a touching moment. Until the dogs ran wild and stampeded the people's houses smashing their few personal goods in such a way that the insurance companies refused to pay for damages. The people let fly at the king with the turnips. So the next day, the king called a meeting of his advising firm, Bobble and Bangle. "Let's put this in the crossbow and see how it shoots, Midas," said Bangle. "What you'll do is slay a dragon!" "Hmmm," said the king, "won't that be expensive?" "You're deep, Bangle. Really deep." So, on the appointed day, the king strode north to do battle with a fire-breathing dragon. Which, of course, wasn't a real dragon at all. It was a big balloon, much like the one used during the royal Thanksgiving Day Parade. "On guard, foul fiend," shouted King Midas, raising his ax. "Thus I....uh...Thus I....uh." "What's the matter?" asked Bangle. "I forgot my speech," said the king hanging his head. "Never mind the speech. Just swing the ax." Unfortunately, even before he could swing the ax, the dragon sprang an air leak and deflated to about the size of a beach ball. "He's a fake!" shouted the crowd, and let fly with the turnips. Now they didn't just despise the king. They actually hate him. The king called a metting of his adviser, Bobble. "Well, sire," said Bobble. "Let's just throw this in the moat and see if it floats. What if we give you the so-called golden touch." "Not if you just use this spray gun and this cheap gold paint." "Good thinking, Bobble. Very penetrating." The word spread in a flash. "Midas: 24 Karat Monarch!" the papers read. The king promised a big free demonstration, and the people came from all over. And indeed, with one squirt, he changed everything into gold: hats, canes, bushes, pencils, rocks. "If the king says it's gold, then it's gold," reasoned the people. "Hooray for King Midas." Well, the king sprayed more and more things until everything in the kingdom looked as if it were made of gold. Midas, of course, was very popular. Thee was just one problem: since everybody had more make-believe gold than he could use, gold began to lose it's value. Soon it took a wheelbarrow full of gold just to buy one turnip. "Bobble, you've done it!" said Midas. "The people like me and I'm still the richest man in the kingdom." "Uh...not quite, sire. The country has gone off the gold standard." "What? Well, what is the standard now?" Yes, turnips it was. And of course, everybody had some turnips. Everybody except the king, that is. With nothing but gold, he was the poorest man in the kingdom. The next day, he called a meeting of his advisers. But there was nobody there but him. So King Midas had to move to a very modest castle with a twin-sized bed and a moat about as deep as an October puddle. But he still has lots of friends and, of course, he still has the Golden Touch. Want to read another fairy tale? Note: There were 91 Fractured Fairy Tales. I loved all of them. so you can get an idea. To read them all, buy the book listed below! A Division of Universal Studios.